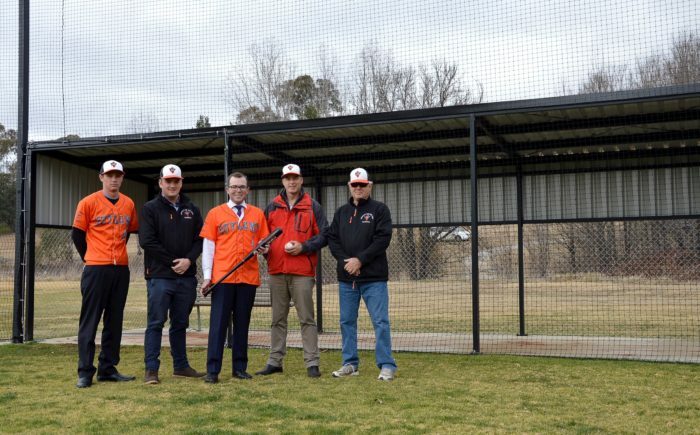 Armidale Outlaws baseball Club has secured further funding from the NSW Government to upgrade its dugout facilities, players Sam McKay, left, Pat O’Connor, Northern Tablelands MP Adam Marshall, Outlaws’ treasurer Mick Alldis and president Dale Smith. ARMIDALE baseballers will get some dedicated dugout seating soon after Northern Tablelands MP Adam Marshall stepped up to the plate to secure funding for it. Mr Marshall hit up Premier Gladys Berejiklian for the cost of providing the seating for the Outlaws Baseball Club and the $3,643 grant will see a home ground win with two, six-metre lengths of seating with back shelving about to be installed. Mr Marshall said the seating should be delivered this month and will mean the players don’t have to lug plastic picnic chairs in a couple of ute-loads to the Sports UNE ground they call home each time they play. “Outlaws Treasurer Mick Alldis has been instrumental in getting baseball established again in Armidale and in the past couple of years has driven the club to getting runs on the board for the sport here,” Mr Marshall said. Mr Alldis said the donations drive saw some 107 people sign up $100 each to become co-owners of the club, with an astounding 35 of those from the USA, where being able to boast about being a baseball club co-owner carries kudos. The Outlaws boast players ranging in age from 17 to 60 and train on the ground every week for six months of the year. They field two teams, in A and B grades, in the Tamworth-based competition but host home games in Armidale every few weeks so the facilities need to keep pace with player expectations. “This has been our third year of playing in the Tamworth competition,” Mr Alldis said. Mr Marshall said the Outlaws were looking to bigger and better things on the field in the future, not only in attracting more juniors and more teams, but also sometime down the track in getting a first class exhibition game at the home ground. “Maybe we could get Sydney and Brisbane teams to meet half way and play a game here,” Mr Alldis said. Mr Marshall said it was a pleasure to be able to support the development of the club’s playing facilities at the University of New England. “It’s always a difficult process establishing any sports club from the grass roots up and being able to get some funding two years ago of $14,000 to help establish the ground and netting was something I was very pleased to support,” Mr Marshall said.